Before I flew into Aurukun the Director of Nursing at the Health Clinic told me she employed two Tongan security guards to keep the nurses safe in the clinic on after hours emergency call outs. 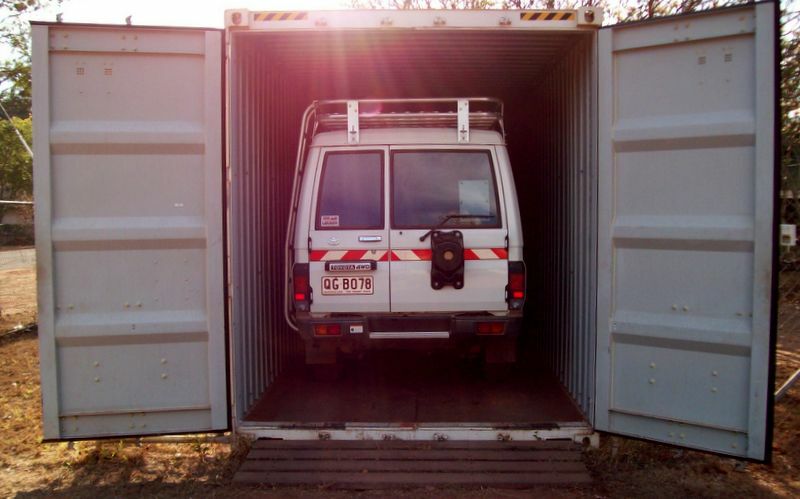 When I arrived in 2008 I was taught how to lock the ambulance securely in a shipping container. Prior to that idea ambulances had been stolen and wrecked by local youths hungry for adventure. I soon became accustomed to carrying several keys for various secured doors and the padlocks of closed heavy metal gates. The word security means the state of being free from danger or threat, it comes from an old Latin word, securitas, which means “free from care”. Aurukun over the past 20-30 years has had a history of violence, riots in the streets and fighting between families and clans. The reasons are too many and complicated for this post. But it’s resulted in the need for high security measures for all who work there. It’s an odd thought that to be safe and free from care actually requires a large amount of resources, planning and attention. It’s just another paradox I’ve encountered as a remote area nurse. There are many ways to learn, many paths to education. I completed my nursing training at Maryborough Base Hospital in 1991. It gave me a Certificate in Nursing. I now have that certificate plus over 25 years of nursing experiencing. I never had the time or money to upgrade my certificate to a degree as I was responsible for bringing up my four children. Now I plan to begin a creative writing degree next year, but I’ve been writing one way or another for over 50 years! There is endless discussion on whether hospital or university education produces better nurses. Valid arguments come from both sides. Each needs to qualify what they mean by better, but it’s difficult not to be in agreement with both sides. And what about the many writers over the years who have never been to university and yet have produced much loved and treasured stories? The ideas and thoughts around learning and education are endless. I was taught to suture, cannulate, plaster, take blood and evacuate patients by ambulance by my colleagues. I was doing the work for six months before I was offered a four day course in remote nursing skills. By then I considered myself capable. I read recently of a post graduate course in remote nursing. My five years of experience has turned me into a competent practitioner. What am I getting at in todays post? Just a reminder that learning and education comes in different guises and to be open to accepting what’s offered to you, don’t discount learning experiences that come less formally, Life’s a great teacher. I have probably learnt the most during my nursing years from people considered the least important, patients and their families, enrolled nurses and health workers and agency nurses like myself. 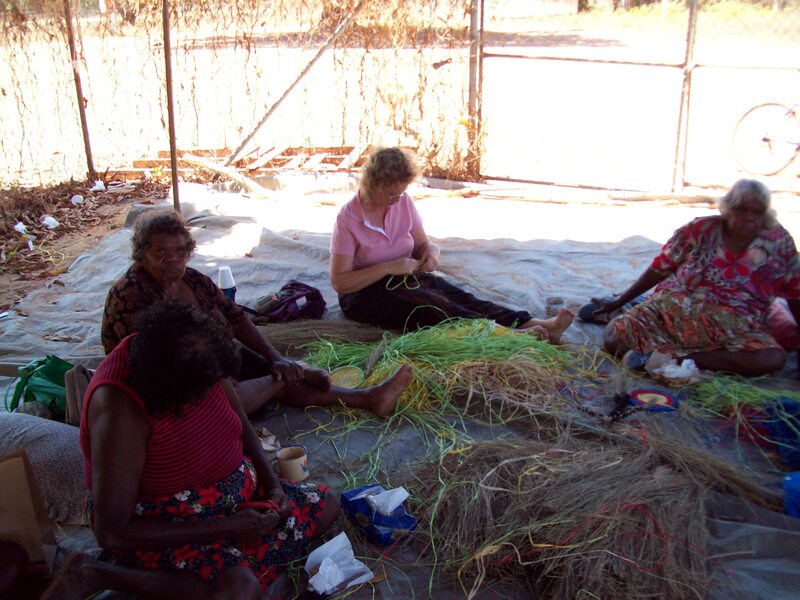 The photo is me sitting with visiting desert women to Aurukun in October 2008 learning to weave baskets, they spoke no English. Hi, my name’s Sharon and welcome to my blog and my first post. The above are the opening lines of a memoir I’m writing about the past five years of my life as a remote area nurse in Indigenous communities in Australia. It was curiosity that led me from being a Paediatric nurse in a Base Hospital to my first job in Aurukun on the west coast of Cape York at the top of north Queensland. It wasn’t a cold, detached or clinical curiosity. It was warm, caring and almost passionate. I wanted to see the hidden places in my country. I wanted to experience and understand Indigenous culture. I think I also wanted to learn what it meant to be a real Australian! That was the preoccupation of my high school English classes where we perpetually searched and questioned Australian literature in the quest for our national identity. But I always had the feeling that the reality of the identity wouldn’t be found in books, plays and poems but in traveling the country and knowing it and its people intimately. It’s been an amazing five years and my passion to understand it all has led me back to books…to reading, writing and photography. And curiosity still won’t let me go. I’m about to embark on a new journey. I’ve enrolled in university next year to study creative writing and photography.